Our local media is vital to our democracy. But how can we make this media sustainable when the traditional business model for local news is under significant threat? 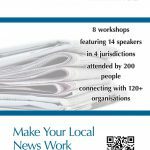 This report, based on 8 workshops with activists from around the UK, examines the demand for local news and explains how co-operative ownership could help to deliver a positive future.